On a beautiful Sunny November day we arrived at one of our Upper River Test locations to pick up some tips from We Fly Fish chalkstream specialist guides Stephen and Mick. This fishery is set in classic Hampshire Estate water meadows, and is probably the most historic fly fishing location in the world. This system offers dozens of miles of idyllic fly fishing water with gin clear chalk aquifer water percolating into the river offering a near perfect environment for the wild and stocked game fish. In November the trout season is over for the year so are targeting the grayling, known as the ‘lady of the stream’ which shares the habitat with the trout. Working slowly upstream either creeping quietly on the bank or carefully wading we find pods of grayling and target them using dry flies and nymphs. In the morning nymphs worked better, and we use small tungsten weighted French nymph patterns, delicate 3 lb tippets, and strike indicators. Strike indicators serve two functions – to keep the fly fishing at a set depth and to offer a visual indication when a fish takes the fly. We carefully cast upstream of the fish and let the flow carry the fly drift down to the fish in a ‘dead drift’ presentation to make the artificial insect look as natural as possible. New Zealand style strike indicators made of a short length of buoyant wool are used which land with the delicacy of a dry fly avoiding the disturbance of a solid plastic or foam indicator. Solid strike indicators are great for different situations such as more turbulent rivers, but not here on the chalk streams where we need all the stealth we can achieve. The New Zealand style indicators are also easy to reposition as we have to adjust the depth of the fly frequently according to the depth the fish are at, the weight of the nymph, and the flow in the spot we are fishing. The objective is to get the nymph into the feeding zone of the fish. Bite detection when nymphing is an art, and you have to expect plenty of false ‘positives’ when the fly hits the uneven bottom, and some missed takes. We soon get into the fish once the right size and colour nymph for the day is found. Later in the day there was a hatch of olives and the grayling were rising and hunting subsurface for nymphs, prompting a switch to an unweighted pheasant tail nymph fished upstream without a strike indicator over shallow weed beds. Also successful was an emerger pattern fished in the surface film, the Klinkhammer (designed by the Dutch angler Hans Van Klinken). This pattern has a ‘post’ sticking up above the fly to help spot the fly in the water, and orange coloured post we used picked up the Autumn sunlight perfectly, making it easy to track progress of the fly and watch for takes from the grayling. 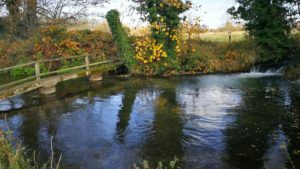 Chalkstream fishing requires reasonably accurate but not particularly long casts so not recommended for first time fly fishers, but for anglers with some casting experience this is a way to sample the iconic chalk streams at ‘off peak’ prices. We Fly Fish offer guided grayling fly fishing from October to March on the River Test in Hampshire and River Kennet / Dunn in Berkshire, starting at just £260 for a guided day. Contact us now hello@weflyfish.co.uk to fish in the footsteps of the great Victorian fly fishers. Fly Casting Championships – Congratulations Scott!Fly Fishing Fun!